How can I best view the Leonids meteor shower? If you live near a brightly lit city, drive away from the glow of city lights and toward the constellation from which the meteors will appear to radiate. For example, drive north to view the Leonids. Driving south may lead you to darker skies, but the glow will dominate the northern horizon, where Gemini rises. Perseid meteors will appear to "rain" into the atmosphere from the constellation Gemini, which rises in the southeast around 11 p.m. in mid-October. If you can see each star of the Little Dipper, your eyes have "dark adapted," and your chosen site is probably dark enough. Under these conditions, you will see plenty of meteors. Circle October 14th on your calendar, for early that morning a moderate to possibly very strong showing of annual Perseid meteor shower is likely. The very strong display will favor those living across much of the Northern Hemisphere. In this region, meteor rates might briefly rise to a few hundred per hour (the time frame for the most intense activity is anticipated sometime around 21:40 GMT). Waning Gibbous. Leonids shower gazing conditions will not be ideal. The moon will obstruct all but the brightest Leonids. Name origin: Appears to radiate from the constellation Leo. History of Leonids coming soon! Stay tuned as the Spacedex write up is currently in progress.. The Leonids meteor shower is one of the most famous of the annual meteor showers. While it is known to deliver a great yearly viewing experience, every 33 years it puts on an event like no other. Every 33 years the Earth passes a dense cloud of junk and debris from Comet 55P Tempel-Tuttle. When this occurs, it is possible to observe literally hundreds of thousands of “shooting stars” every hour. The next time this massive spectacle will occur is 2023, but until then, the Leonids should make for a pleasant viewing experience for first time and avid observers alike. In 2016, the Leonids are best viewed on the night of November 16th though the morning hours of November 18th. Eager sky watchers who are fortunate enough to have completely clear skies may witness between 15 and 20 meteors per hour. The peak, also known as the time frame for the most intense activity, is anticipated during the early morning hours on November 18, 2016. As one can imagine, the less cloud cover, natural light from the moon, light pollution, and precipitation present, the greater the number of meteors you’ll have the chance of viewing. If you happen to live near a brightly lit city, if possible, we recommend that you drive away from the glow of city light. After you’ve escaped the glow of the city, find a dark, safe, and possibly isolated spot where oncoming vehicle headlights will not occasionally ruin your sensitive night vision. Look for state or city parks or other safe dark-sites. If you can see each star of the Little Dipper, your eyes have "dark adapted," and your chosen site is probably dark enough. For the best view, meteor gazers should face east toward the constellation Leo (The Lion) and look slightly overhead. This way you can have the Leonids’ radiant within your field of view. Leo is the radiant of the Leonids meteor shower, which means that meteors appear to radiate from within the constellation. Correspondingly, the Leonids meteor shower is named after the constellation Leo for this reason. Unfortuantely, in 2016, the Leonids meteor will peak during the Waning Gibbous Moon. Due to this, the natural light from the Moon may make it difficult for stargazers to observe fainter Leonids meteors. If you're willing to brave it out in the cold (or warmth, depending on your location), you may be treated to a modest number of “shooting stars.” Spacedex wishes you and yours an absolutely magnificent viewing experience on the night of Leonids! 902 AD: Astronomers in China witnessed an impressive Leonid storm. "The stars fell like rain." 1799: A “shower of shooting stars" shocked people in the Americas. A German naturalist named Alexander von Humboldt was among those individuals who witnessed the spectacle. He reported seeing thousands of enormous fireballs within a four-hour period, frequently with the brightness of Jupiter and with long trails that were visible for several seconds. A few even exploded. 1833: Just before sunrise on November 13th, meteors fell from the sky in eastern North America like flakes of snow at a rate of about 30 flashes per second. A number of people thought that the stars in Heaven were falling from the sky and that Judgment day had arrived. Of course, a few days later, the stars were still there. 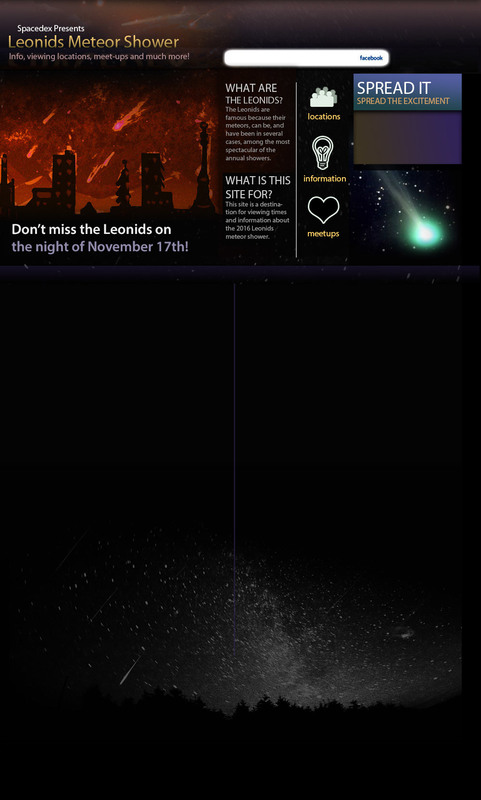 The 1833 Leonids were one of the most stunning meteor displays of the second millennium. 1865: Ernst Tempel and Horace Tuttle separately discovered the parent comet of the Leonids meteor shower, to which their names would be attached. Eventually, the comet's period was determined to be a little more than 33 years, matching the time between maximums in Leonids. The connection between the comet and the Leonids was assumes. 1966: On November 17, astronomers in the central and western United States saw an incredible storm of meteors, peaking at a rate of about 150,000 per hour during a 20-minute period. 1994: The first increase of Leonid rates in a long time, announcing the return of the parent comet. Astronomer Peter Jenniskens was among the first to notice the high Leonid rates on November 18 that year, when the shower was as strong as the Perseids in August. The outburst lasted a little over a day and was rich in bright meteors. 1998: Observers all over the world were greeted by numerous fireballs and long lasting persistent trains. The peak of this component was over Europe. Participating researchers monitor a second Leonids peak that is now thought to be a far encounter with the distorted 1899 dust trail. 2001: While most forecasts emphasize the 1866 dust trail encounter over Asia, research concludes that the meteor storm over the continental USA will be excellent as well. Throughout North America, a spectacular storm is viewed by millions of people in a Moon-less weekend night. Leonid MAC scientists have a prime view of this 1767 dust-trail encounter onboard the FISTA aircraft. Waning Gibbous Moon. Leonids shower gazing conditions will not be optimal. Moonlight may t wash away fainter Leonids.